Bread is one of the best things on earth. It is so versatile, and it really just makes a meal. Even bad bread is still so easy to eat, but why would you waste your time eating bad bread? Why not just make it yourself? Bread is one of those things that really intimidates people. Yeast seems like a terribly scary thing, particularly if you've never used it before. I must admit that I was wary of bread before I began my internship. I had used it here or there to make cinnamon buns or challah or baguettes, but I wasn't entirely convinced. Once I started working with Nathalie, I realized that yeast was no harder to work with than sugar or butter. Julia and I have made bread often enough this summer that I no longer fear it. I know I can make a good loaf of bread. The only trouble with yeasted breads is the time component. Sometimes you just can't wait for the bread to double multiple times; you need bread. NOW! Luckily, there are some breads that are simple to whip up and take no time to bake. One of my favorite recipes to use in these types of situations is beer bread. Last night, beer bread didn't feel right. I started scanning the internet and turning pages of books. 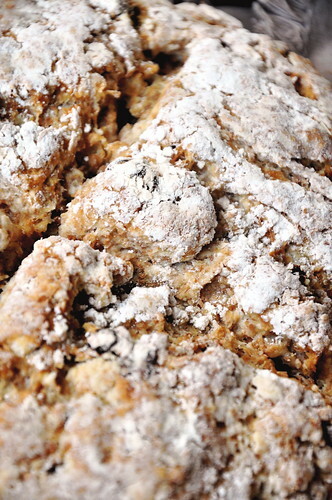 My new bedside read, The SoNo Baking Company Cookbook, had a yummy sounding recipe for Irish soda bread. One problem. It called for yeast? 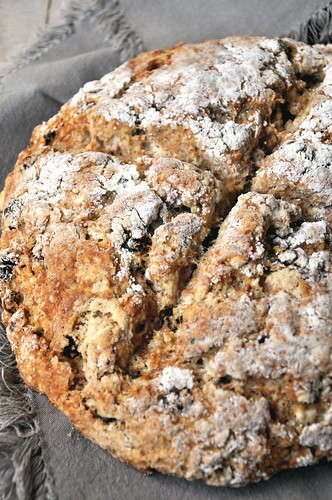 Who in the world has heard of an Irish soda bread that calls for yeast? I certainly haven't. I decided to leave that recipe for another day, a day when I wasn't beginning my baking at 8 o'clock at night. I turned to Martha, of course, and found a straight-forward recipe that sounded so good I didn't even care that it would take over an hour to bake. I ended up getting too antsy, so I formed a flatter loaf in order to cut down on the baking time. 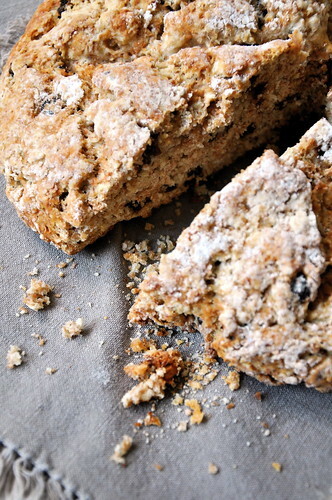 I cannot tell you how much I love Irish soda bread. It is just barely sweet, and it has the most incredible texture. It is really indescribable. Every other bite brings a sweet little raisin into the picture. Add some good Irish butter, and you have the perfect midnight snack. This particular bread is everything I want my Irish soda breads to be. 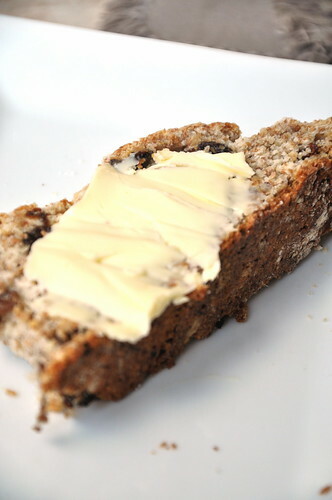 I couldn't have asked for a more perfect introduction to homemade Irish soda bread. Preheat the oven to 350 degrees. Line a baking sheet with parchment paper. Whisk the flour, salt, baking soda, baking powder, and brown sugar together in a large bowl. Scatter the butter over the flour mixture. Work the butter into the flour mixture, using a snapping motion with your hand, until the mixture resembles well-crumbled feta. Stir in the wheat bran and raisins. Make a well in the center of the flour and pour the buttermilk into the well. Stir to combine, careful not to over-mix. Turn the dough out onto the baking sheet and form the dough into a circle 10 inches in diameter. Dust the top with flour. Bake for 50 minutes until the top is golden brown and a cake tester inserted in the center comes out clean. Serve warm or at room temperature with a generous smear of Irish butter. quick breads are great ! !